A sea change is underway among many of today’s girls: they are developing faster and entering puberty earlier than ever before. Just a generation ago, fewer than 5 percent of girls started puberty before the age of 8; today that percentage has more than doubled. Early puberty is not just a matter of physical transformation — it’s deeply psychological too, with effects that can put a girl at higher risk for behavioral problems as well as long-term health challenges such as obesity, depression, eating disorders, and even cancer. Why is this happening and what does it mean for our girls’ futures? What can we do to help lead them through this major transition to live happy and healthy lives? 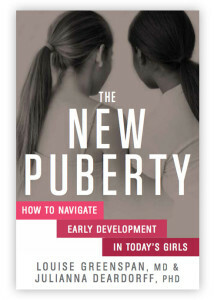 In their groundbreaking book, The New Puberty, Louise Greenspan, MD, and Julianna Deardorff, PhD—two leading experts on the root causes and potential consequences of early puberty in girls—have written a reassuring and empowering guide that will forever change the way we view puberty and parent the next generation. Drawing on original cutting-edge research and years of clinical experience, Drs. Greenspan and Deardorff explain why girls are developing earlier, and identify both established and surprising triggers—from excess body fat and hormone-mimicking chemicals to emotional stressors in a girl’s home and family life. They offer highly practical strategies that can help prevent and manage early puberty including limiting exposure to certain ingredients in personal care and household products, which foods to eat and which to avoid, and ways to improve a child’s sleep routine to promote healthy biology. Moreover, the authors—both mothers of young girls—offer parents, teachers, coaches, and caretakers guidance to initiate and continue the conversation about puberty in an age-appropriate way to support girls as they navigate this complex stage of their lives. Impeccably researched, engaging, and urgently needed, The New Puberty provides the roadmap to help young girls move forward with confidence, ensuring their future well-being.